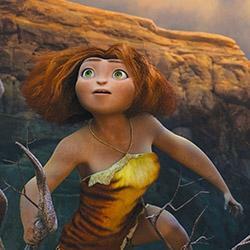 Eep in the Croods has a strong, athletic body and typical princess story dreams. How feminist is Dreamworks’ new heroine, the cavewoman Eep? “You’re heavy,” Ryan Reynold’s character, Guy, tells Emma’s Stone’s teenage counterpart, Eep, early in DreamWorks Animation’s new 3-D feature, The Croods. “Thanks,” Eep gushes. It’s a simple exchange, but it was easily my favorite in this rollicking, prehistoric tale. Eep is the latest animated heroine to grace our movie screens, and in some ways her debut on Friday will be a feminist victory: Her dense, compact body and swinging, clinging athleticism are a far cry from the skinny Ariels of the past. But The Croods’ progressivism only goes so far. In the end, Prince Charming still holds the glass slipper. Eep and the rest of her family are modeled after Olympic athletes—swimmers and gymnasts in particular, writer/director Kirk DeMicco said at a press conference in New York City on March 8. “We wanted it to be believable that Eep could live in that time period and that she could climb these rock walls and move like she moved,” DeMicco said when I asked him about the character’s physique. But Eep, though she is described as “rebellious” and “aspirational” in press materials, can only attain freedom through the slender, shirtless boy who shows up and leads her to it. We get the look of a new female protagonist but the same old Prince Charming story. Guy, for example, introduces her to shoes, fire, and the revolutionary idea that a better tomorrow awaits her. Along with Eep’s dependency, we get her chubby, dumb little brother; a “wild beast” of a little sister; a strong but deferential mother; an overprotective father; and a grandmother who is “ancient, some say, at age 45.” All of them are endearing but not exactly stereotype-shattering. It’s a shame, because co-writer/director Chris Sanders has said that the higher number of female characters in The Croods means that more could be done with them. But he’s also said that he and DeMicco wanted to indulge in “the dopey caveman world,” as well as work against aspects of it. The characters in The Croods navigate that imaginative world with ease, and I’m not sure how evolved any kids’ flick about Neanderthals needs to be. Still, Ryan Reynolds said he wants Guy to get a shirt if there’s a sequel. I’d like to see Eep get some autonomy.